Every season has its own special qualities on Mackinac Island, but Fall seems to bring out the true beauty. Warm breezes turn crisp and the deep green of the pine trees mingle with the flaming reds and yellows of the Maple and Beech trees. If you are planning a trip to enjoy the Island’s majestic beauty this fall, we have put together a list of our top 7 tips to make your trip the best it can be. Wear Layers. Our fall season can be unpredictable. It could be 40 degrees in the morning and 70 degrees in the afternoon. To stay comfortable, be sure to wear a jacket that you can easily remove in the warmer sunlight hours. Do your research. Even if you are a loyal, repeat guest, be sure to check out our website for improvements in parking and arrival procedures. We have had quite a few renovations this year and we want you to be prepared when you arrive. We do suggest that all guests arrive one hour prior to the departure that you would like to take. Check opening and closing hours for your favorite activities and stores. The fall season brings shorter hours and some activities close mid-October. You can check with the Mackinac Island Tourist Bureau for closing dates. Familiarize yourself with the boat schedule. There are fewer departures in the fall and we end our day earlier, as well. So make sure you know our schedule before arriving and departing. Take a tour. It doesn’t matter if you take a carriage, horseback, or bike tour, less crowds means less wait and less congestion. That makes it an ideal time to tour the Island and see what it has to offer. As we mentioned before, be sure to check hours of operation, as most activities end earlier in the day when we’re not in peak season. If you plan to take a Mackinac Island Carriage Tour, please confirm the carriage tour hours as they can change day to day and with weather. Dine Alfresco. Many restaurants on the Island still offer outdoor seating in the fall. Take advantage of that option. Nothing gives you more of a Mackinac feeling than dining outdoors and hearing the boats and the clip-clop of horses hoofs. Venture to the center of the Island. 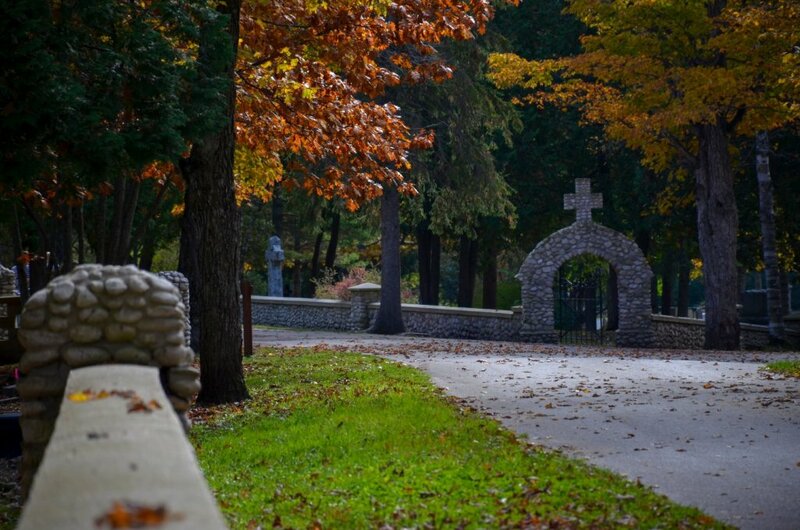 Take a hike to see Skull Cave, Sugar Loaf, and the historic cemeteries. Not only will you not overheat with the cooler temperatures, but you’ll also get to see the amazing colors that the trees show off at this time of year. Here are some bonus tips (since we couldn’t stop at just 7). If you do decide to take a hike to see the foliage, make sure to visit Fort Holmes at the top of the Island. There is no better vantage point to see the panoramic view of Lake Huron, Round Island, the Mackinac Bridge, and the trees showing off their finest colors. Grab a cocktail at the Pink Pony and enjoy the sights and sounds of the harbor – you may even see a freighter pass by. Fort Mackinac is open until October 28th this year, and you will still be able to watch cannon and rifle firing demonstrations daily. Armed with this information, you are surely going to have the best trip this fall. We can’t wait to see you on the boat! 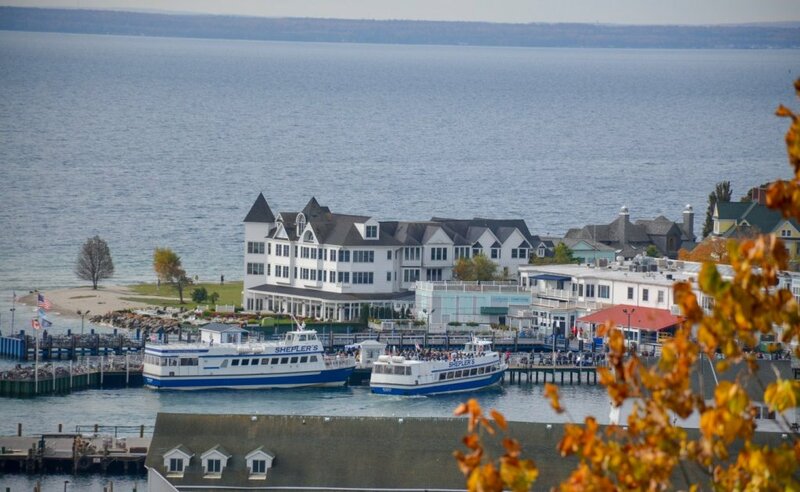 Fall is one of my favorite times to visit Mackinac Island!